Note: This lab was created with GNS3 using Cisco 2620 routers, but you can create the lab with other real hardware if it is available, although it may be necessary to modify the configuration to adapt to the network interfaces and the outputs may vary from what is shown in this lab. 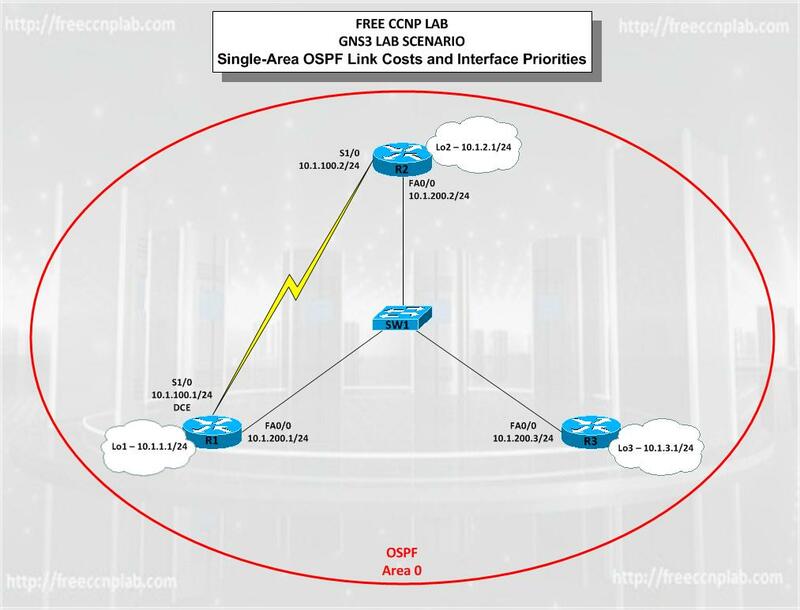 Configure single-area OSPF on a router. Advertise loopback interfaces into OSPF. Verify OSPF routing information exchange. Utilize debugging commands for troubleshooting OSPF. Configure all routers and switches with their hostname as shown in the network diagram. Configure the console password as ”sanfran” and the enable password as “cisco”. Using the addressing scheme in the diagram, apply IP addresses to the Fast Ethernet interfaces on R1, R2, and R3. Create Loopback1 on R1, Loopback2 on R2, and Loopback3 on R3, and address them according to the diagram. Configure the serial interfaces on R1 and R2 with the IP addresses shown in the diagram. Add the clockrate command where needed. Verify that the appropriate interfaces are up and that you can ping across each link. Enter the OSPF configuration prompt using the router ospf process number command. The process number is a locally significant number that does not affect how OSPF works. For this lab, use process number 1 on all the routers. Add interfaces with the network address wildcard mask area command. The address is an IP address. The mask is an inverse mask, similar to the kind used in an access list. Put all interfaces in OSPF area 0, the backbone area. This command can be confusing at first. What it means is that any interface with an IP address that matches the address and wildcard mask combination in the network statement is added to the OSPF process in that area. The wildcard mask used in the network command has no influence on the actual IP subnet mask that is advertised with a network on an interface. The network command selects interfaces to be included into OSPF, but OSPF advertises the real subnet mask of the network attached to that interface (with the only exception being loopback interfaces). For example, the command network 10.1.200.1 0.0.0.0 area 0 adds the interface with the IP address of 10.1.200.1 and its network to the OSPF process into area 0. The wildcard mask of 0.0.0.0 means that all 32 bits of the IP address have to be an exact match. A 0 bit in the wildcard mask means that portion of the interface IP must match the address. A 1 bit means that the bit in the interface IP does not have to match that portion of the IP address. The command network 10.1.100.0 0.0.0.255 area 0 means that any interface whose IP address matches 10.1.100.0 for the first 3 octets will match the command and add it to area 0. The last octet is all 1s, because in the wildcard mask it is 255. This means that an interface with an IP of 10.1.100.1, 10.1.100.2, or 10.1.100.250 would match this address and wildcard combination and get added to OSPF.